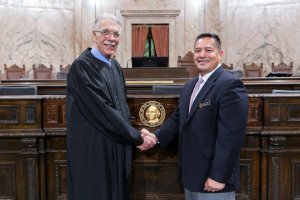 The Washington State House caucuses filled their leadership rosters this week, officially electing members to designate positions announced in November and filling remaining vacant positions. House Democrats have a 57-41 edge over Republicans this session. A few positions in the majority will change hands: Rep. Monica Stonier, who served as Deputy Majority Whip last session, will now serve as Majority Floor Leader. Also new to their positions are Reps. Christine Kilduff, Kristine Reeves, Bill Ramos, and Jared Mead. Reps. Ramos and Mead were elected to the Legislature in 2018; Mead is the youngest member in the chamber. Just three members of the House Republican Caucus leadership team will remain in the positions they held last year: Minority Leader Rep. J.T. Wilcox, Deputy Minority Leader Rep. Joel Kretz, and Assistant Minority Floor Leader Rep. Drew MacEwen. Joining the leadership team are Reps. Paul Harris, Gina Mosbrucker, Jacquelin Maycumber (who delivered the Republican Response to Gov. Inslee’s State of the State address earlier this week), Morgan Irwin, Dan Griffey, Bill Jenkin, Kelly Chambers, and Jenny Graham. Reps. Chambers and Graham were elected to the Legislature in 2018.